One of my favorite photos of Kate Moss. Alice in Wonderland meets Easter. Let’s talk about this dress for a moment – it’s by Trollied Dolly via Asos. The dress has a bit of a retro feel to it but the print is really what captured my attention. The print is called “Honeybee” and yes, it has little bees all over. I don’t really like bees in real life but in print they’re perfect. 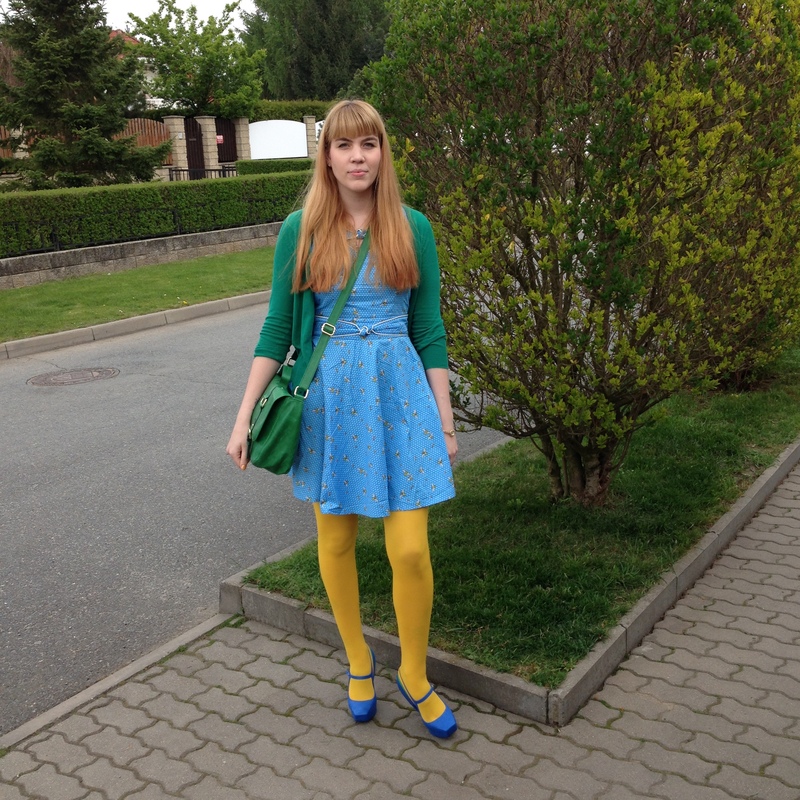 Because there’s a bit of yellow to the otherwise blue dress, I decided to pair it with my yellow Asos tights. I knew I wanted to wear my green Zara cardigan and my green H&M satchel bag and then I was wondering which shoes to choose to complete the look. Oh and I also wore my Asos vintage watch and a pair of Asos rabbit earrings. I thought these shoes were a perfect match as there’s blue to go with the dress and then there’s a yellow stripe and a green stripe. So it really went full circle! 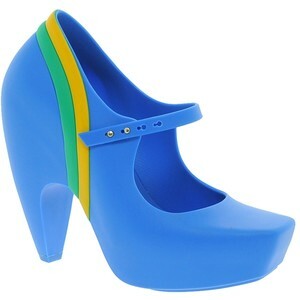 I don’t think I have to add that I’m a Melissa fan and I love jelly shoes in general, but I must say that I have found these shoes difficult to wear. I have wanted to wear them before but then always changed into something else last minute. I got the shoes via ebay and they’re a UK size 6, but I think I could have used a half a size up (although Melissa doesn’t do half sizes) as I find the toe of the shoe a bit uncomfortable. Also the heel of these shoes is rather heavy! So definitely not a walking shoe. (I’m so glad we went by car!) Anyways, it was a lovely day (with a wonderful lunch, though I did eat way TOO much. Why do grandparents insist on overfeeding their grandkids?) and I was happy to save another pair of shoes.